Halloween has become a big holiday. Like, scary big. The National Retail Federation estimates Halloween spending will reach an all-time high of $8.4 billion this year. While that number is truly monstrous, what really matters is how much you’re going to spend this year. So before you start buying costumes and candy from that pop-up Halloween store, check out these four simple tips to budget your fun. 1. Find money that’s already in your budget. Look at trimming $10 or $20 from a few different areas of your budget. For example, take a little from your entertainment category and apply it to Halloween instead of a movie ticket. It’s easy to find the cash you need when you’re willing to move things around. 2. Use creativity to reduce costs. Look inside your closet to find some old clothes that you can make into a costume. Also, check out thrift shops and dollar stores to help keep your dress-up budget within reason. 3. Look for neighborhood trade groups. If you don’t already have one, start a Facebook group and invite people in your neighborhood to buy, sell or trade Halloween stuff. If your neighbor was Waldo last year, chances are he wouldn’t mind selling his costume to you for cheap. 4. Check out free family festivities. Is there a pumpkin patch nearby or a spooky (or not-so-spooky) celebration happening in your town? 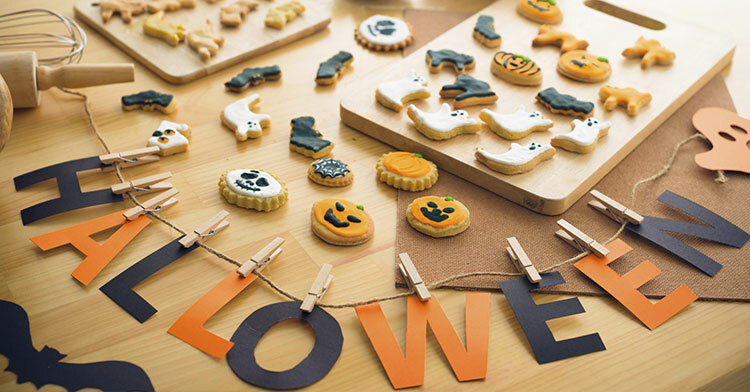 Look for free activities going on in your neighborhood so you can focus more money on costumes and candy! When you create a budget for Halloween, you leave all the screams to the haunted houses and Alfred Hitchcock movies. And when you make a plan and stick with it, don’t be surprised if things work out well for you. Like, scary well!